Is Hemp Oil Beneficial in Losing Weight? Losing weight is a holistic process -- there isn't any one supplement that can get rid of extra pounds. Hemp oil is high in the "good" omega-3 fatty acids your body needs. It also contains gamma linolenic acid, which may help you lose weight. Taking hemp oil supplements, or substituting hemp oil for other oils in your diet, may help you lose weight, but you've got to cut out empty calories and exercise more, too. Hemp oil has 725 calories per 100 g serving, or about 100 calories per tbsp. That's less than olive oil, which has about 120 calories per tbsp. Hemp oil is an attractive light green color, with a nutty taste, and it works beautifully as a salad dressing. If you use hemp seed oil instead of olive oil in your vinaigrette, or instead of high-calorie bottled dressings, you'll lose some calories -- and get more omega-3s, too. The American Heart Association recommends eating oily such as salmon and sardines because of their high levels of omega-3 fatty acids, which help guard against heart disease and can lower triglycerides. Most studies so far on the beneficial qualities of omega-3s have been done using oils other than hemp. 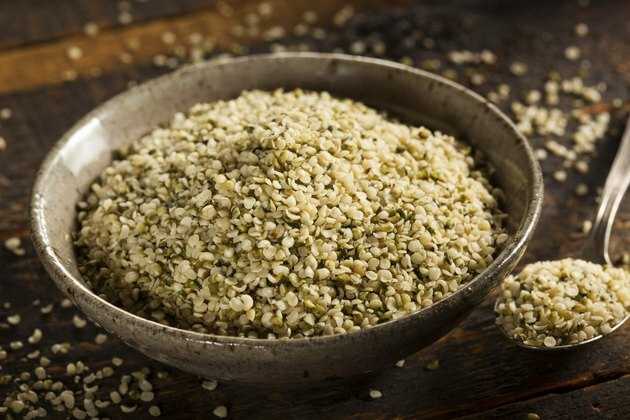 According to an analysis done by researchers at Rutgers University, however, the fatty acids found in hemp oil are "ideal for human nutrition." The Rutgers analysis also confirmed that hemp oil has a significant amount of gamma linolenic acid. GLA has been shown to help with preventing weight gain in several studies, including a University of California study published in the June 2007 issue of "The Journal of Nutrition." Researchers gave one set of formerly obese people evening primrose oil and a control group olive oil, and after one year found that those taking the GLA supplement had gained back less weight. Another 2007 study reported in "The Journal of Nutrition" showed that when mice were given fish oil along with a high-fat diet for five months, "body weight gain was significantly reduced" compared to mice fed the same high-fat diet with no fish oil. The researchers also observed increased metabolic activity in the intestines of the mice eating fish oil, and they concluded that this "upregulation" of intestinal metabolism was "associated with the anti-obesity effect" of fish oil. Hemp oil is easier to use than other sources of omega-3 fatty acids and GLAs because it tastes better. It's also considerably cheaper. Hemp oil is a good choice for those concerned about mercury contamination in fish, too. Keep your hemp oil in the refrigerator, and use it while it's fresh. Don't use hemp oil for high-temperature frying, as heat can "denature" the unsaturated fats, turning them into trans fats.